For those interested, the Hurricane Sandy mess continues. 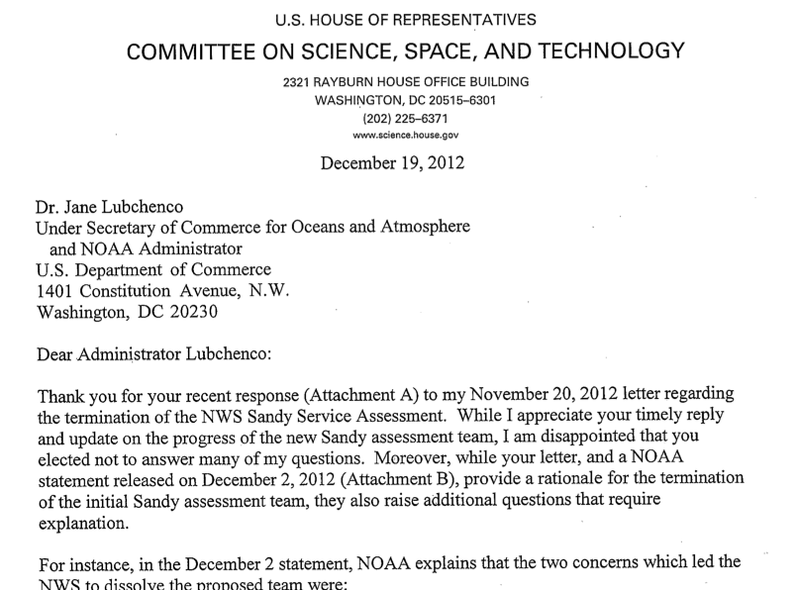 You'll recall that U.S. House sent a letter to NOAA requesting an explanation of the termination of post-Hurricane Sandy assessment of which I was co-chair. You can learn more about that ten day effort here. 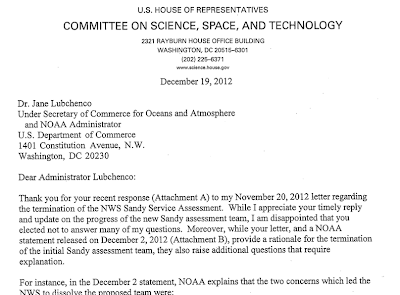 NOAA sent a non-responsive reply that left most of the questions answered. So, another, quite pointed, letter has gone out to NOAA. Rep. Broun's letter makes no mention of the "hurricane deductible" but it would be surprising if it was not in some way related to NOAA's strange behavior. As representative Broun's letter points out, this critical aspect of the NWS's performance has been removed from the new Sandy assessment as has the performance of the National Hurricane Center. The NWS assessment team members have been forced to sign non-disclosure agreements (this has never been a requirement before) and NOAA will review the final document. And, if the NWS or NOAA expunges important information, the members of the assessment team will have no recourse since they've signed NDA's. I was not asked to sign an NDA nor would I have signed one if asked. Question: Is this how you want your tax dollars spent? I suspect we have not heard the last of the original Sandy assessment. ADDITION Friday, 2:35pm: See above. NOAA sent an email to Roger saying the members were expected to "maintain confidentiality" but an NDA has not been required. Those are the same requirements under which I accepted the appointment.